When you need to know something about PowerShell, Jeff Hicks is one of the more knowledgeable people in this area. Hicks (@jeffhicks) is a PowerShell MVP and IT veteran with more than 25 years of experience, most of that time has been spent specializing in Microsoft server technologies. Today, Hicks is a consultant, trainer and author, and contributes to the 4SysOps and Altaro Hyper-V blogs. He also runs his own blog, The Lonely Administrator, and is a contributing editor for Petri.com. "Hicks has deep ties within the PowerShell community, all the way up to the development team at Microsoft. He is also a teacher, so everything he posts on his Twitter account and blog has an educational benefit," said Tim Warner, an IT professional, technical trainer and author based in Nashville, Tenn.
Hicks tweets about 400 times a month to his 8,600 followers, and his updates range from new PowerShell scripts to tips and monthly reminders for admins. 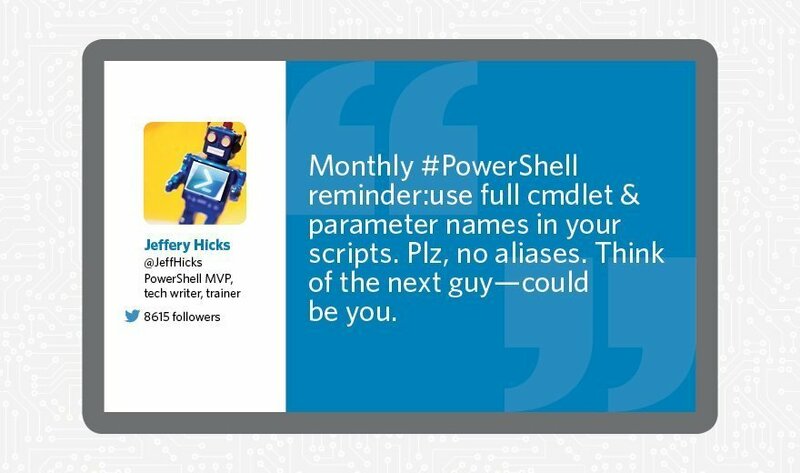 Should a follower get stumped on anything PowerShell-related, Hicks is always willing to help, Warner said. "Anybody on earth can ask him a question, and he'll answer to the best of his ability," he said.